Google has agreed to acquire Waze for over $1 billion, so we already knew that the social mapping service was seen as very valuable for the Mountain View company. But, now we're hearing from the Waze CEO about what he thinks is the value that his company will be able to add to Google, and most of his guesses are about what you'd expect. The interview with Waze CEO Noam Bardin comes from Forbes, and was originally done back in January. At that time, Bardin hinted that he thought Google was the best fit of the potential suitors the company had, and he got his wish. He also said that a big part of the value of Waze for Google would be in its ability to maintain maps in real time. Bardin said that Google had invested somewhere around $15 billion to maintain its maps, whereas Waze simply relies on the crowd-sourced data from its users. Of course, there is the value added to advertising and offers. 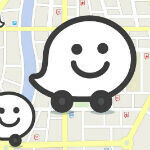 Bardin said about Waze that, "General navigation and maps, are really the ‘search’ for mobile." And, he added that the best way to monetize ads with a mapping app is to not have monetization as the focus. The focus of Waze is to save people time, and from there: "Now that I know where you drive, I can begin offering you deals, I can begin enhancing the experience… If the goal is monetization, it doesn’t work." There is a lot more interesting stuff in the interview if you want to check it out at the source. Bardin definitely knew where his company was going, and it paid off in a big way. Google maps will now be in a stronger position over other mapping systems as Waze is integrated into it. So Google spent $1 billion for Wazes crowd sourced traffic feature? Couldn't Google just have implemented Facebook or Google+ to their own maps app to get real time updates from its users traffic positions? Why start from scratch when you can give out some pocket change to acquire the most mature crowd/social-sourced maps out there?